A branching shrub, 3 to 10 feet high with oval, elliptic or obovate leaves, wider and shorter than those of the Pinkster, conspicuously soft-hairy beneath, rarely nearly smooth. Flowers rose color to white, very fragrant, on glandular pedicels, expanding with or earlier than the leaves; corolla 11 to 2 inches broad, the tube of the corolla densely glandular on the outside but scarcely viscid; stamens projecting somewhat from the flower. In woods, New Hampshire and eastern and southern New York south to Florida and Louisiana. Flowering in May. 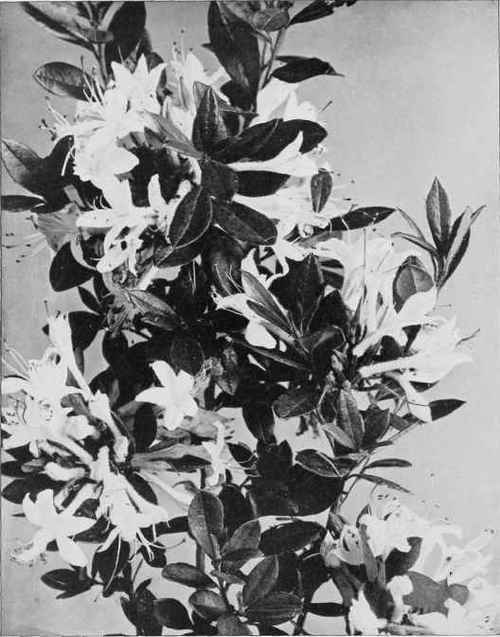 The White Azalea (Azalea viscosa Linnaeus) is usually a lower shrub, 1 to 6 feet high, with small oblanceolate leaves which are smooth or with a few scattered hairs above and on the veins beneath, often whitish beneath; flowers white or rarely pink, very fragrant, appearing after the leaves unfold; the tube of the corolla very sticky and glandular. Frequent in swamps from Maine to Ohio, Arkansas and Florida. In New York rare or infrequent north of the Atlantic coastal region. The Flame or Yellow Azalea (Azalea lutea Linnaeus) with very showy, orange-yellow or red flowers, is found in the lower Hudson valley, and from the Catskill region southward along the mountains.